Jump ropes are dated back to the 1600’s. Australians and Egyptians started by using vines and flexible bamboo from the jungles to form jump ropes. By the mid 1900’s, jumping rope became popular in the United States. It started out as a type of play for children, but after the invention of the television in the late 1950’s children put jump rope on the back burner. The jump rope wasn’t completely forgotten about though; in the 1970’s it made a comeback! The 1970’s brought an increased interest in health and physical fitness. This in turn brought jumping rope back to the children to keep them active. Competitions (like Double Dutch) were created to fill the need and interest of this activity for the young children. Since the comeback of the 1970’s, jumping rope has remained a valuable form of exercise. 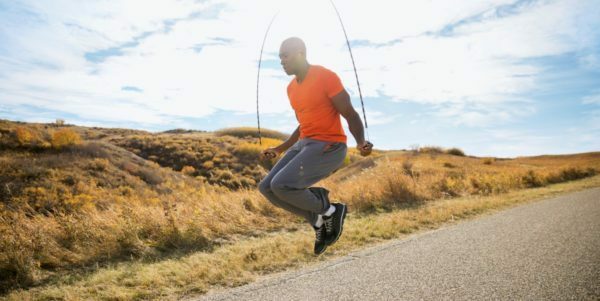 Having been around for over 400 years, the jump rope must be doing something right. The benefits linked with jump rope are tremendous! First and foremost, jumping rope burns calories, faster than most other forms of exercise. You can burn 10-16 calories per minute, reaching 480 calories in just half an hour. Jumping rope helps to build agility and quickness by improving your balance and coordination due to the concentration of your mind on your feet. This is important for boxers, which is why they implement jumping rope into their workout routines. Jumping rope helps to increase bone density and is also good for your brain. Everyone knows that any form of exercise is good for your brain, but exercise that includes both physical and mental demands, like jumping rope, have higher impacts on cognitive functioning than other forms like the treadmill or bike. The best workouts for brain health involve three things: coordination, rhythm, and strategy. Jumping rope fits these three factors perfectly, being the ideal form of exercise for brain health. Lastly, jump ropes are affordable and easily portable! Most jump ropes range anywhere from 5-20 dollars, making it a very inexpensive, effective form of exercise. Also, jump ropes can easily fit into your suitcase when you are traveling, still providing you with a good workout wherever you may go. Jumping rope can be implemented into your workout routine as a warm-up, cardio, or into a HIIT circuit. ← Stick to That Resolution! Join our Health & Wellness Academy to learn nutrition, physical activity, and obesity prevention strategies! High-Intensity Interval Training is when you give 100% effort through quick bursts of exercise, followed by short, sometimes active, recovery periods. It's a great way to get in shape fast!! Join us for HIIT with Haley! Self Defense starts tomorrow, April 6th at 9am!